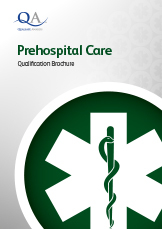 To find out more about our Prehospital Care qualifications, simply click on the links below or to download our Qualification Brochure here. Did you know that our progressive suite of vocational Prehospital care qualifications form part of a programme to become a Paramedic in 2 years? With quality and practicality at its heart, this fantastic new pathway has been designed to allow Learners to work towards becoming a Paramedic, whilst gaining hands-on skills and experience at the same time. 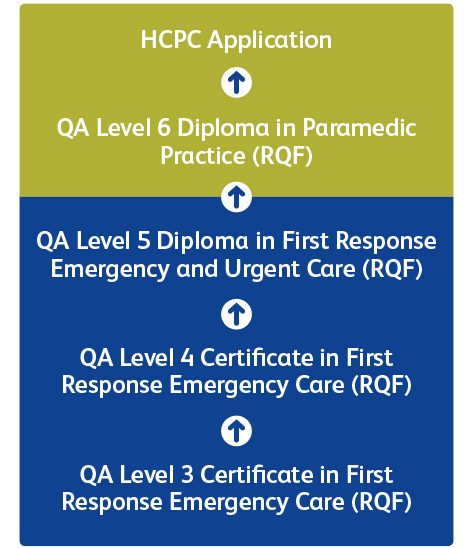 Broken down into stages, Learners first undertake levels 3, 4 and 5 of our First Response Emergency Care (FREC) qualification suite, before going on to complete the QA Level 6 Diploma in Paramedic Practice (RQF). This flexible structure allows Learners to progress in stages, so they can use their skills within Prehospital care roles whilst they continue to progress through the programme. To find out more about our other Prehospital care qualifications, simply click on the links below or download our Qualification Brochure here. QA Level 3 Award in Basic Trauma and Casualty Care (BTACC) (RQF) – NEW!